DUBROVYTSYA, Ukraine -- Vlad’s black SUV softly crunched through the gravel in front of Dubrovytsya’s faded Polish Catholic church. The deep scars of recent amber mining can be seen in Dubrovytsya, Ukraine, despite government restrictions on the practice. The sound of circular saws echoed from inside, where workmen were restoring the 300-year-old rococo cathedral to its pre-Soviet glory—allegedly with money from the illicit amber trade. Stas, Vlad’s partner, parked his BMW a couple blocks away. The former cops popped the trunk of Vlad’s 4x4 and he pulled out a shotgun. He grabbed a few shells and put the gun in the back of our truck. “We’re always armed when we go out,” said the illegal amber miner. 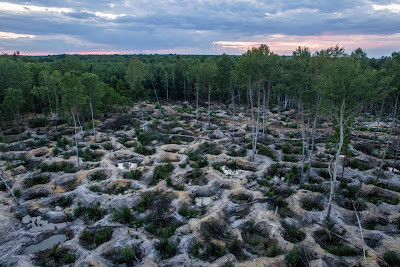 And for good reason—the town sits in the heart of Ukraine’s Wild West—the thousands of acres of ravaged pine and birch forests whose sandy soils hide millions of dollars in amber. As in other gold rushes, violence has followed the scramble for the semiprecious gemstone, with gangs fighting over lucrative pits and claims rife that corrupt government officials are battling for territory and control. On January 15, assailants armed with machine guns and grenades attacked young men in a coffee shop in the town of Olevsk, killing one and seriously wounding around a dozen others. Pictures from the scene show blood and handguns splashed across the snow. The rush is built on the backs of tens of thousands of poor villagers as they illegally blast apart the landscape with pressure hoses, digging from the loose earth of northwest Ukraine the brown lumps of fossilized tree resin made famous in Jurassic Park. On our way out of town we passed a modest showroom selling legal jewelry and Orthodox icons encrusted in the finished product—polished bits of amber gleaming from buttery yellow to clear dark honey. Nearby, a row of shops sold home furnishings and construction supplies as people rush to use the money from the bonanza to fix up their small homes or build new ones. The banditry is so widespread it has become a sort of dark joke—a wink, a nudge and a Kalashnikov. We picked up speed as we left town, cruising through open farmland and old villages. The influx of amber money means that every other cottage has been repaired or was being modernized. Soon we entered a dark forest of green pine and white birch that hid thousands of shallow amber pits—what locals call a Klondike. A crackdown by the government had temporarily emptied the wood, but the scars of mining were everywhere. 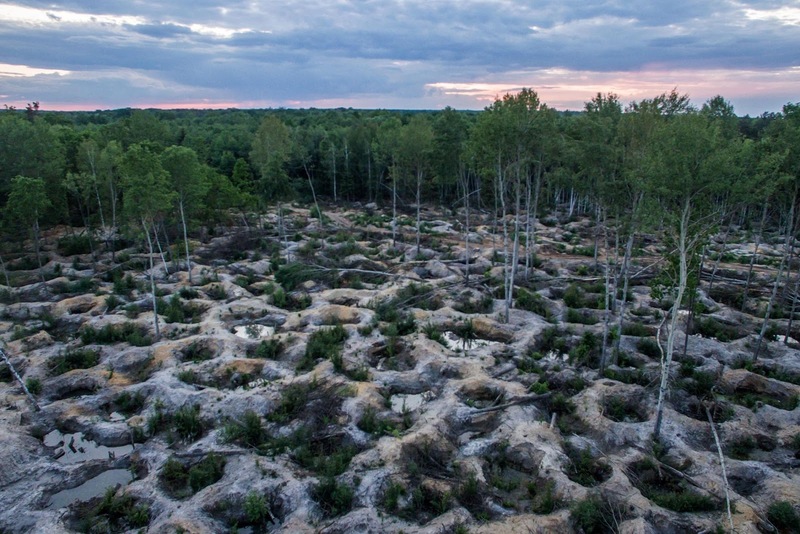 On one side, a few acres of trees had been clear cut to make room for the mines—leaving a pitted, lunar landscape that looked like the trenches and craters of World War I, or the battlefields in Ukraine’s war torn east. On the other side of the road the forest tilted at crazy angles, its trees uprooted as miners dug their shallow pits. It looked like a tornado had blitzed the forest. When amber is mined on a large scale, the visible impact is industrial. Acres upon acres of forest are clear cut and backhoes are used to dig a channel to a water source—usually a river. Then thousands of miners descend on the Klondike and use water pumps made of old Mercedes van engines to blast into the ground, sucking water from the canal in huge tangles of pipe. Across the region, hardware stores are packed with the tools for amber mining—coils of giant rubber tubes, wading boots, fine fishing nets, and the evil-looking snouts of the pressure hoses: handmade steel bores outfitted with spikes and teeth to cut into the ground. As the wildcatters pump water into the earth, deep pits form and the amber, lighter than the rocks and sand, is pushed up in the water column. Women and children as young as seven are tasked with netting the stones as they reach the surface and flow out of the hole. “This is a really major environmental issue,” said Ostap Semerak, Ukraine’s minister of ecology and natural resources. It is not clear how many thousands of hectares of land have been destroyed by the illegal mining of amber. And the minister acknowledged that the problem is multifaceted and will not be solved overnight. “Amber is really a very serious, complex problem, not only in the context of ecology,” Semerak said. “There are at least four components—environmental, criminal, social, and economic” that are closely entwined. “On this stretch of road at the beginning of the year, there were 10,000 people working in the forest here,” said Stas, as we drove along. “Miners’ cars were parked along the roadside for three miles in each direction. There were five, ten, sometimes even 50 police here, but they couldn’t do anything,” says the former cop, highlighting the lawlessness of the region. On our visit, there were no miners around, and the trashed woods were eerie. We stopped and Vlad grabbed his shotgun. Stas stalked purposefully through the trees, leading us to one pit that looked like all the others. But this was a famous pit, because it was here that a team of eight wildcatters had dug four meters through topsoil and loose sand and hit the jackpot. “The guys working here pulled $50,000 worth of amber from this one pit in one day,” said Stas. In a country where most people make around $2,100 a year, this $6,250 windfall per miner would mean a completely different life. “I have a boy and girl, six and seven years old,” said Vlad, standing next to the hole—now collapsed in and covered in fallen pine needles. Stas quit working as a cop four years ago and started mining, but he remained friends with Vlad. And Vlad sometimes went out on police raids against his friends. “I was making $150 a month as a cop and then the currency fell against the dollar. How was I supposed to feed my family?” said Vlad. So he quit and joined his friends in the amber fields earlier this year. “When I began, my wife said I should have started five years ago!” he said. Within a few months he saved around $25,000 and bought his black Toyota Land Cruiser. To show me, Stas pulled out his phone and showed me a text message from an illegal Chinese wholesale buyer in Kiev, Ukraine’s capital. A rare, 100-gram stone is worth $4,800, it read. An intact, 50-gram piece pays out $3,800. Even a 2-gram piece is worth $150. “Right now the Chinese are paying about $2,000 to $3,000 per kilogram, if you have big stones,” said Stas. The amber is then made into jewelry and other products, much of which is sold in China. “Fights happen all the time, every day,” Stas added. And it is not just fists and shovels. At one point two crews got in a fight at this Klondike. To settle it “someone threw a grenade into the yard of a house as a warning,” Stas said. “It’s like Chicago in the 1920s. It’s a small town, but the mafia is even worse here,” said Stepan Tsaryuk, the 28-year-old chief of police in Dubrovytsya. He is a former special forces soldier and bears the scars of a machete strike on one arm, a wound received while fighting in hand-to-hand combat in Ukraine’s war on its border with Russia. “We have an open war in the east and a secret war here,” he said. A man was recently arrested on suspicion of transporting a 26.5-pound sack of amber stones worth around $20,700. He allegedly assaulted two officers and tried to escape and was only subdued when more officers arrived on the scene. Another was arrested on suspicion of transporting a 200-pound bag of stones. “It’s not a little bit dangerous, it’s very dangerous,” Tsaryuk said. Just then his phone rang and a relieved smile crossed his face when a deputy said a drunken farmer had driven his tractor into a pond and needed to be pulled out. Since the bonanza began a few years ago a local trauma doctor said he has treated miners for grenade wounds, gunshots, and stabbings. He whispered to me that anyone can buy a Kalashnikov for $750, or a grenade for $150. It is not only the fighting that puts people at risk. In the past five or six years the doctor has personally treated 500 or 600 people injured in pit collapses. “They dig down five meters and the dirt and sand slips and collapses, burying the men alive,” he said. “And people drink, drink, drink,” said the doctor. “Mostly its drunk driving that gets them. Or drunk digging,” he said. Although there are a few government-controlled mines—the process to get a license to operate a legal mine can take years and is fraught with corruption—most of the operations proceed without much, if any, oversight. “They are destroying the forest,” said Tsaryuk, the police chief. Broader legalization of the estimated $500 million a year amber mining activities might help, said Tsaryuk. But getting there could be a challenge in a country struggling to contain violence and corruption. Government officials and police disagree on how it should be done, and many miners remain opposed. “If they legalized the trade, a sack worth $1,000 now would drop to around $500, and the government would skim off the remainder for themselves,” said Stas as we climbed back into the 4x4. Even two years after the revolution in Kiev that was meant to end the rule of a kleptocratic government, corruption continues to be a monumental issue. Many believe the government will not be able to satisfy requirements by the International Monetary Fund that the country enact stronger anti-corruption laws. Because of this, Ukraine has only received around $7.7 billion of the IMF’s $17.5 billion loan. “After the revolution, the amber miners came up to me and asked, ‘So, do we pay you now?’” said Oleksandr Zadorozhniy, a young member of the city council who participated in the protests and fighting to overthrow the former government in the winter of 2013-2014. “I told them they don’t pay me. We would now operate legally and pay taxes. But to this day, nothing has changed. No one wants to legalize the amber trade because there is too much money to be made from bribes,” said the councilman, himself a former illegal amber miner. Some of the confusion comes from the gemstone’s history in the region. In Soviet times, locals “used amber like we use coal today,” says Tamara Yakovenko, 83, sitting on a bench in front of her picturesque cottage, situated on the banks of the shady Horin River below the Polish church. She has lived her entire life in Dubrovytsya. Since common people couldn’t accrue wealth in the USSR like they can today, amber was not valued. “No one needed laws on amber 25 years ago. It would be like a law on apples or a law on peanuts, there was no need for it at the time,” said Colonel Sergey Knyazev, the former provincial commander of the police. At the Rivne Amber Factory, a government run enterprise nearby, they specialize in polished stones and gaudy, amber encrusted religious icons and portraits. In Ukraine, they are highly coveted. Sergey Martyniuk, the deputy director, has a bit of perspective on the situation. He said the amber mined in the area is made illegal because the wildcatters mine it illegally. “It’s like you buy a car and get in and you’re ready to drive off and the guy stops you and says you need a license,” says Martyniuk. Back in Dubrovytsya, Yuri and Ivanna Yurkevich, who run the legal jewelry shop, said their neighbors in town do not care about licenses. They have money right under their feet and nothing will stop them from making their lives a little bit better. But a crackdown this spring by the new government in Kiev confused the situation. “At least under Yanukovych (the former president) there was one hand to pay. It was better. Now it’s like an octopus,” said Yuri, standing in front of a jewelry counter filled with amber pendants, earrings and rings—and small bags of powdered amber that he says helps with rheumatism when mixed with moonshine. Before the revolution, the protection rackets for illegal mining were allegedly run by the Ukrainian successor to the Soviet KGB. “But right now it’s not clear who the roof is,” said Yuri. A raid by the special police this spring threw these and other problems into stark relief. A convoy of ten old Soviet-era 4x4s and newer trucks stuffed with masked and armed special police blasted into the forest near Dubrovytsya. But a spotter on a moped half hidden by a roadside tree called the miners on his mobile phone and warned them. By the time the raiding party found the right track through the woods, more than 30 miners had blocked the road. They angrily faced off against the armed police, saying they had no right to deprive them of their livelihoods. The convoy forced its way through, but the miners had stalled the police long enough to have a chance to hide their expensive pumps. The raid got lost in the woods and was tracked by a gang of young, shirtless men on motorcycles. Finally, all momentum was lost when the masked police were stopped by the main body of miners. More than 200 angry men blocked the road. Most of the miners, furious, refused to talk. Sitting in the grass while the police commander negotiated with the head of the village nearby, the anger of one miner overflowed. “I have eight children. How am I supposed to feed them?” asked Sasha, 42, from the nearby village of Netrebe. His words were met with laughter and angry agreement from the rest of the miners, sitting in the grass, their clothes spattered with dried sand.